For on-site work, a portable table saw is more practical than larger, heavier table saws. It rips and crosscuts; it miters and cuts compound angles, rabbets, and tenons. It can also function as a shaper and a sander, when equipped with appropriate blades. Portable table saws, which are occasionally referred to as bench table saws, are often made largely of aluminum for ease of transport. They consist of a box that contains the motor, controls, and blade mechanics, along with a table top through which the blade protrudes. Portable table saws do not come with built-in stands, but leg sets can be purchased separately or fabricated without much difficulty. They can also be used on top of sawhorses, workbenches, or other level surfaces at the work site. Like the larger iron table saws designed for shop use, portable table saws adjust for different cuts. The blade can be raised and lowered for cutting stock of various thicknesses (a table saw with a ten-inch blade can cut stock slightly more than three inches thick when the blade is fully extended). The blade can also be tilted to make bevel cuts. The cutting surface on portable table saws is smaller than on shop models (roughly one and a half by two feet square, rather than approximately two feet by three and a half feet). This is perhaps the greatest single disadvantage of a portable table saw: A larger tabletop makes the tool safer and easier to use, offering more support and stability for the work piece while sawing. However, a portable sawhorse or similar device of the same height as the table can be bought or made, and it can be positioned to support either boards or lumber. Essential accessories for any table saw are a miter gauge and a ripping fence, both of which help guide the work piece safely past the blade. The miter fence, as it is also called, is a pushing device for making crosscuts. The miter gauge adjusts to any angle you wish to cut, and slides along the table top in either of two parallel grooves that run the length of the working surface on either side of the blade. The rip fence is clamped in place, also parallel to the blade, and allows boards to be ripped evenly to the selected width. Blade guards are also standard on all new saws. 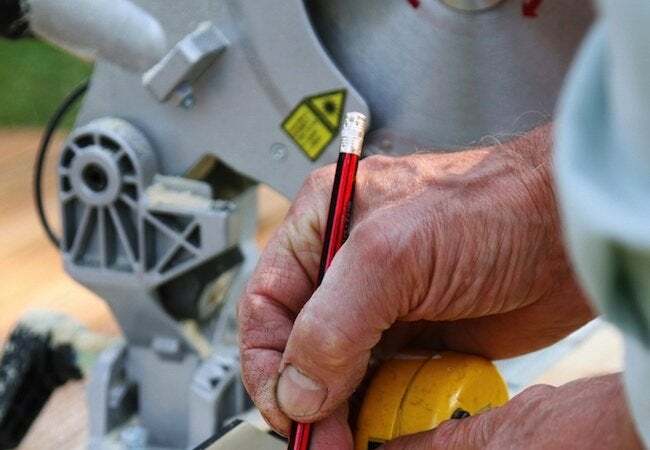 If you have a durable old table saw (the good ones can last many, many years) that has no guard, you should consider installing appropriate guards. These should include at least a metal or plastic covering over the blade itself, and if you do any ripping, a splitter. The splitter is a fin-shaped piece of steel as thick at its widest point as the width of the saw kerf. Situated beyond the saw blade, the splitter separates the wood to prevent the stock from binding on the blade. Most new saws also have anti-kickback fingers, metal grippers that help prevent the work piece from being propelled backwards and hitting the sawyer. Use the guards. Period. There are already more than enough carpenters and cabinetmakers, professional and amateur, with incomplete sets of digits thanks to the power saws of the world.